Is there a rehab for funfetti cake batter addicts? Because if there is, I need to go. I can’t seem to get enough. This cookie cake is the latest way that my obsession love of Funfetti has manifested itself. And boy is it tasty. Everything you’d expect. 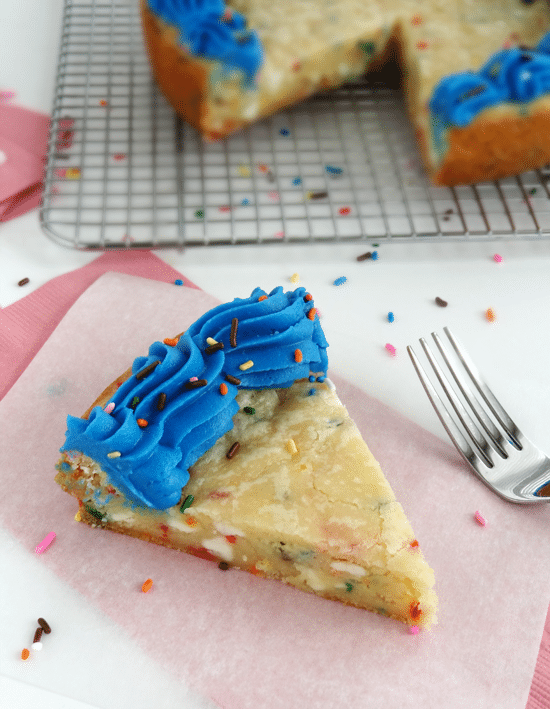 Funfetti in the moistest and chewiest cookie cake form. With icing. Yes, please! I’ve made it a few times now and it is always a hit. And it’s not hard to make. However my stubbornness led to one flaw (if you can really call it that) with this cookie cake. It has what I like to call a lip, or a hump, around the edge. It’s covered with icing because I like icing on my cookie cake, but if you look at the side you can see it there. I call your attention to it because I don’t want you to make this and then freak out about it. Just cover it up. Because you need to make this. This thing is pure Funfetti gold. If gold was edible of course. The directions are pretty straight forward and while I mention this in them, I want to make a point of it here. Most cookie recipes say it’s best to refrigerate cookie dough for a while, even overnight, before baking. Not everyone does – it’s a preference as well as a time thing. But I have baked this both after leaving it overnight and after leaving it for just a few hours and I really see a difference (for the better) in the texture of the cookie when it’s left in the fridge overnight. People still loved it the other way too, but I really noticed it. The flavors and textures come together so much more. I really recommend refrigerating it overnight. With that said, you can’t really go wrong. This is the cookie cake that dreams are made of. So go and make it my friends! You won’t regret it! 1. With a mixer, cream butter and sugars together until light and fluffy. 2. Add egg and vanilla extract. Mix well. 3. Add dry cake mix, cornstarch and sprinkles. Mix well. Dough will be thick and sticky. 4. Stir in white chocolate chips. 5. Place dough in clear wrap and refrigerate overnight. 6. When ready to bake, preheat oven to 350 degrees. 7. Place parchment circle the size of your cake pan in bottom of pan and grease the sides. 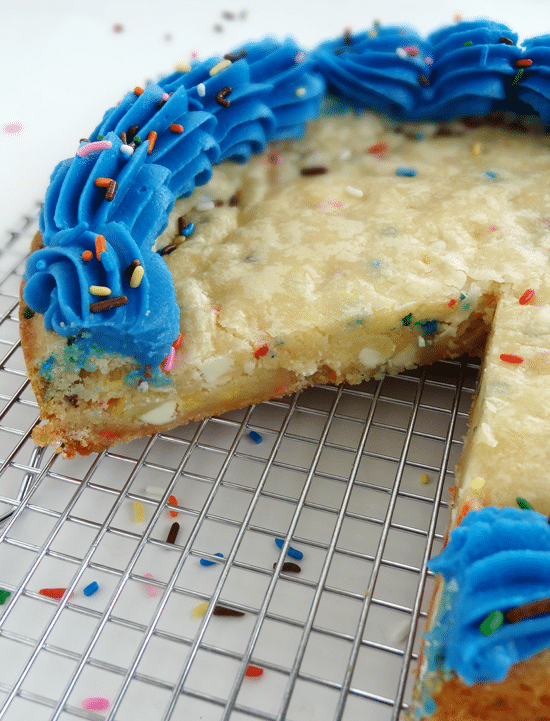 This will help you remove the cookie cake from the pan after it’s baked. 8. Spread dough evenly in cake pan. 9. Bake for 20-25 minutes or until done. The edges should be golden. The center may not seem totally done, but it will firm and cook a little more as it cools. You could cook it for longer, but I like my cookie cake super soft and chewy. 10. Allow cookie cake to cool completely in pan before removing. As it cools, it will firm up and you should be able to remove it from the pan without the center breaking (like I said, super moist!). Certainly if you have a spring form pan, that makes it even easier. 1. Beat the shortening and butter until smooth. 3. Mix in the vanilla extract and 1 tbsp water. 4. Add the rest of the powdered sugar and mix until smooth. Add more water to get the right consistency. 5. Add desired icing color. oh my my… i will definitely be trying this as soon as possible!! 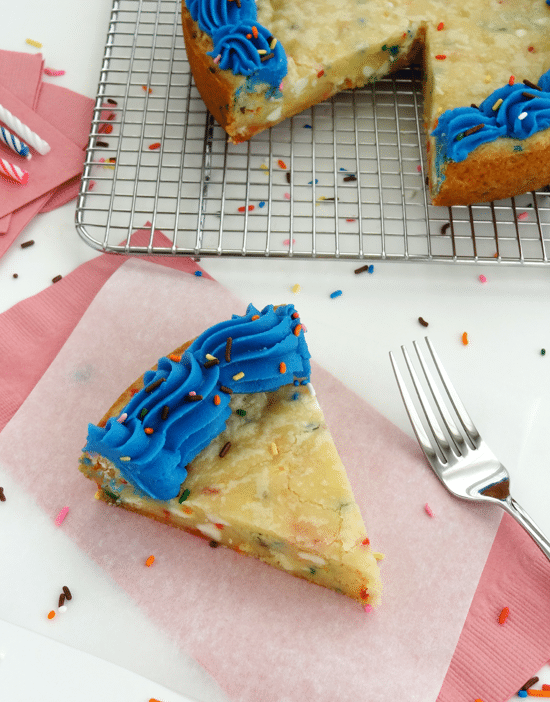 You are the cake batter queen! I’m blown away by this cookie cake. It looks amazing. 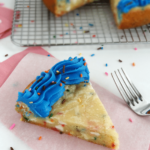 I love the combination of white chocolate + cake batter. 🙂 Your other cookie cakes look just as wonderful, too! You can never have too much funfetti! This cake is gorgeous!! They are totally perfect! I found it really hard to spread the batter after it sitting all night in the fridge. Maybe I did something wrong? I broke it in pieces, and arranged it in my spring form pan. I threw it in at 350 for 4 min and pressed it in my pan. It looks good still, its cooling now. Were you suppose to press it in the pan before you put it in the fridge all night? B.c mine was rock hard like break and bake cookies. Also, we could have easily ate all the batter last night … It was sooo good! Thanks for a great recipe. Can I use my own white cake recipe & add confetti candies myself? Hi Mandy, I’m not sure if it would work. 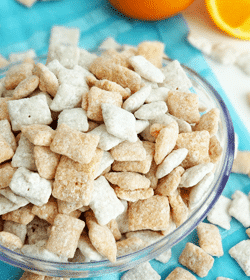 It depends whether or not your mix is the same ratio of ingredients as a box mix. It took a little experimenting to get this one right. Hi Linsday! 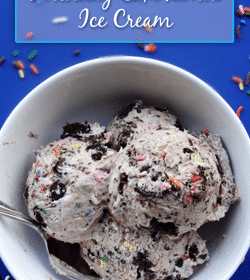 Is the frostingicing recipe for this the same as you posted in the chocolate chip cookie cake? I made this last night. I am very amazed that I ended up with any dough to refrigerate!! I used a 8in pan and it was very thick. Either need to make two pans of it or invest in a 9in! Topped with the buttercream you posted and OHEMGEE! A sliver slice was all I could stand its so rich and fabulous! Hi Ashley, I’m sorry – you can find it here. I didn’t realize you had to refrigerate overnight! How long would you say the minimum hours in the fridge would be? Hi Lindsay! I’ve baked it after refrigerating for about 3 hrs before and while it was fine, the texture and flavors didn’t come together quite as well. I’d say 6-8 hours is best. Stores in our vicinity don’t sell “white chocolate chips”. Will the Nestlé’s Premier white chips work as well. Look’s good and will be making this. Thank’s for sharing. I love funfetti and I love the colour if your icing, it’s so bright and vibrant. I came across your blog on Dandelion Wishes. Does your recipe call for the box that is 15.25 oz? I know they recently changed the box size and a lot of the recipes I used to use no longer work due to the smaller box size. Thanks! Great question Lindsey! I can’t say I’m entirely sure. I think I made this recently enough that it was the 15.25 oz box, but now I think I’ll have to go make it so I can say for sure. I’ll be sure to update the recipe when I’ve re-made it so that there’s no confusion. Thanks for bringing it to my attention! Hi! 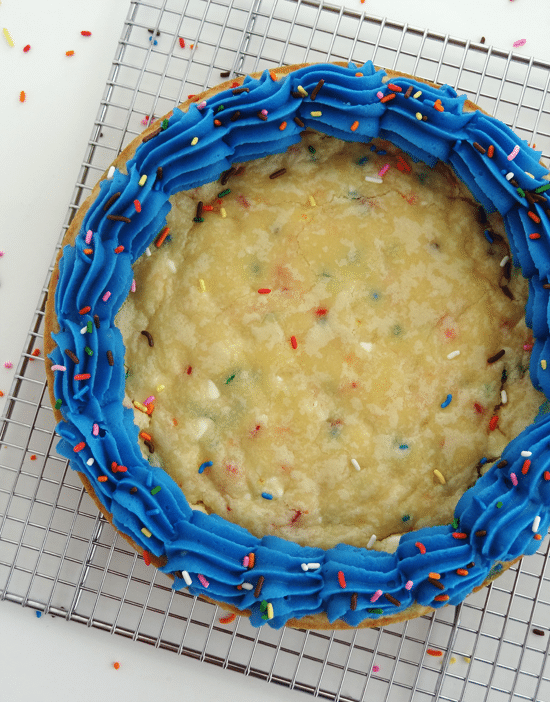 I just checked out both of your cookie cake recipes (funfetti and chic. Chip) I really want to make make one for my birthday and I really want your opinion on which one is best! Please please choose one….. even though you might love them both! Thank you! Hi Allyssa! Have you seen the Triple Chocolate Cookie Cake and Oatmeal Raisin one? Just to make your decision harder. 😉 Of course I love them all and which one I choose usually depends on my mood or the flavor preference of those I’ll be with. But if I had to choose for a birthday, I probably say the Funfetti one. Not only do I seriously love Funfetti, but it’s so festive for a birthday! 🙂 Happy Birthday! hi there, i was just wondering if i could substitute the rainbow chip cake mix? and if you think it would come out good if i poured this recipe into cupcake liners and frosted , for my daughters wedding???? 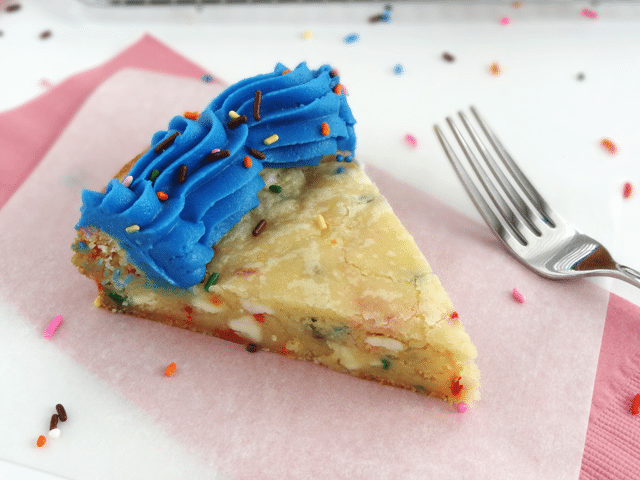 this is your funfetti cake batter white chocolate chip cake!! Can this recepie be done with normal cake mix? I cant seem to fund the funfetti cake mix in any shops around, and when I do eventually find it, its very expensive. Can this be made using a pizza pan? I want to decorate it to look like a pizza. If so what size do u suggest for a not too thin cookie cake? Hi Karla! It’s hard for me to say, I’ve never tried that. Certainly it will bake, but it might spread a fair amount. I’d say whatever size you use, give yourself a good 3-4 inches at least around the edges to allow it to spread. Hi, I’ve got my dough sitting in the fridge right now, it smells ahhmazing! Any chance you’ve tried this in a square/rectangle pan? I’m thinking of trying either an 8×8 or 9×13 and then slicing into squares. Just wondering your thoughts and if that might affect baking time. Thanks! I know it’s been a year since you posted this but I’m looking for the recipe for this and can’t seem to find the link…? I’d love to make this for my son’s birthday party this weekend, but the recipe seems to have gone missing from your original post. Could you please include it? Hi there! I have just made 2 chocolate chip cookies and they look wonderful! I have a question when making the buttercream icing, does the butter need to be softened or cold? I wasn’t sure if it would make a difference….thanks! The butter should be softened. I hope you enjoy them – I LOVE this cookie cake! I’ve gotta make this. I just hope I don’t sit and eat the ENTIRE thing! It’ll be tough not to eat it all – it’s so good! Has anyone tried doubling the recipe and baking it in jellyroll pan? I’d like a bigger one for a birthday party. I don’t know of anyone that has, but I’d think it’d be ok. It might need a different baking time though, depending on how thick it is. What size pan did you bake it in? Terrific! I’m so glad you enjoyed it! Made 4 of your cookie cakes last night to bring in for my birthday treat at work. I’ll comment on each, but this was the first I tried. Very sweet. I’m not a huge white chocolate chip fan so maybe that put it over the edge. I forgot I had to refrigerate overnight so I just put in the freezer for a little over an hour and it was very firm when pressing in the pan. This is definitely the sweetest of my cookie cakes. I hope everyone enjoyed it! Do you think this could be made as regular cookies? I was thinking of making double doozies with it for my son’s class. Just don’t want to waste time making a big disaster if you don’t think they would hold up well. I have made it as a cookie cake and it was fabulous! Read the comments about difficulty with hard dough. I wrapped flattened ball to refrigerate. When I took it out of the fridge, I used a rolling pin to flatten it more while it was still in the plastic wrap. I used a pretty pie plate, so it was easy to serve. So rich you only need a sliver…delicious.